You gotta meet the cool guys I see riding around the west end. They have a windbreaker, no hat (of course no helmet) and crappy gloves. I, in my warm car, was amazed that I saw different three guys out like this on a frigid afternoon. Now maybe they were not commuting, perhaps just going to the store for cigs, but it was still an impressive display of bravado. Joe: Thanks. For next winter, I’ll be working on looking more like a friendly robot who wants to help you rather than one who’s going to shoot you and eat your family. Poika: I can actually understand the windbreaker guys. I generate so much heat on my bike that I generally dress for winter commuting as if it was about 10-15°C warmer than it actually is. I don’t even zip up my jacket most of the time. I usually unzip my fleece about 10 minutes into my morning ride, pull off the mask about five minutes later, and sometimes ride without gloves for the last few minutes. It doesn’t matter whether it’s -20° or +30°, I’m still hot and sweating when I get to the office. 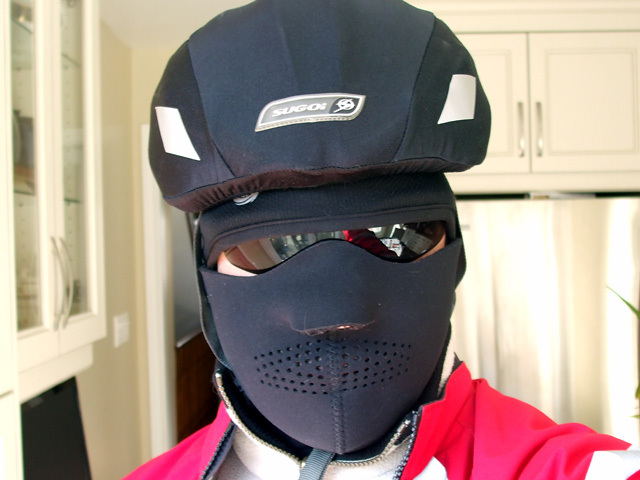 Cycling in the winter keeps you warmer than you’d expect. I’d be impressed if that picture had been taken on the cold, dingy streets of Toronto rather than, seemingly, in the comfort of some kitchen. I withdraw this cranky lunge if you were astride a bicycle – even a stationary bicycle – when the pic was taken. I imagine you wandering your home and the Eaton Centre for hours dressed thus, and then hopping in the Camaro to drive to work. For shame, sir, for shame!